Last here in early 2012 for The Falls Festival and multiple sold-out Sydney Festival performances, Dinosaur Jr frontman / guitar-guru J Mascis returns to Australia and New Zealand in February 2015 for Adelaide's Garden Of Unearthly Delights Aurora Spiegeltent programme, as special guest to premier ambient noise outfit Mogwai for two shows at Perth International Arts Festival, for headline performances along the Australian east coast (including first time solo appearances in Hobart and Canberra) and for three shows on the north island of New Zealand. The 2015 tour follows the release of Tied to a Star, the second solo album from Mascis that picks up exactly where 2011's debut Several Shades of Why left off. As an added treat, former Magic Dirt front woman Adalita will join J for shows in Melbourne, Brisbane, the Gold Coast and Sydney. The two indie-rock luminaries paired up in 2012 for an appearance on SBS TV show Rockwiz performing the Tom Petty / Stevie Nicks classic Stop Dragging My Heart Around though the relationship goes back further with Magic Dirt having supported Dinosaur Jr on their 1995 Australian tour. 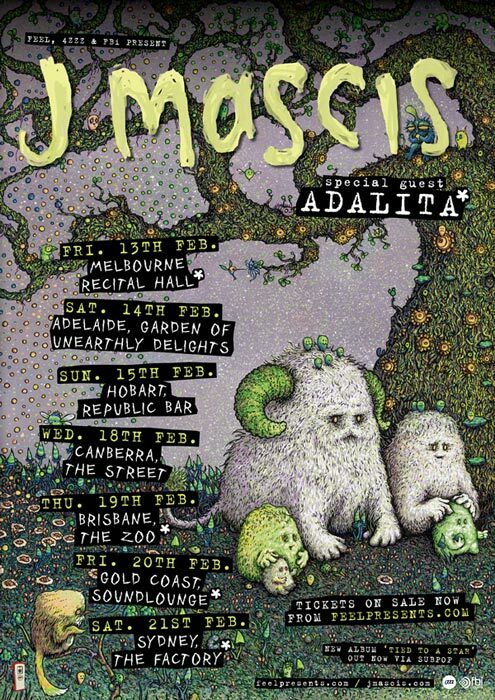 Don't miss J Mascis with occasional special guest Adalita on tour this February. All tickets except Adelaide and Perth on sale Fri 14th November. Adelaide and Perth on-sale now.